The Boy Scouts of America has selected two young people to serve as the 2016-2017 NRA/BSA Brownell Youth Ambassadors. In this role, the pair will represent all Boy Scouts and Venturers at a variety of shooting sports industry events. They’ll work in support of the BSA and the National Rifle Association to promote responsible shooting sports activities within Scouting. At Scout camps across the country each year, hundreds of thousands of Scouts and Venturers participate in shooting sports activities — archery, rifle shooting, shotgun shooting and more. Trained adult volunteers ensure they have safe and rewarding experience. Shooting sports are one of the many ways that Scouting teaches character to young people. The activities are known to both attract and retain youth in the Scouting movement. The two NRA Youth Ambassadors are Jamie Lear, 18, of the Amarillo, Texas-based Golden Spread Council; and Keaton Sharp, also 18, of the Houston-based Sam Houston Area Council. Their first major assignment is to represent the BSA and the NRA at the National Shooting Sports Foundation’s SHOT Show in January in Las Vegas. 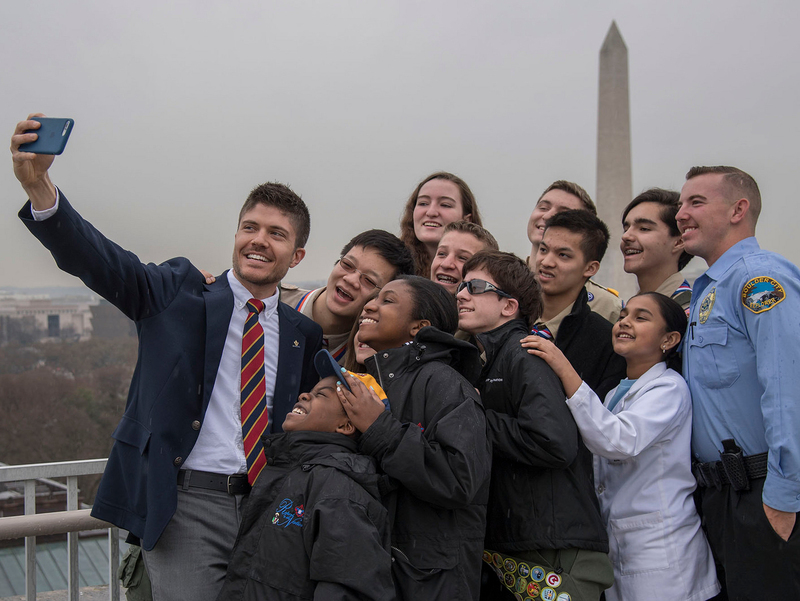 They’ll attend meetings, visit and thank sponsors, and support the mission of the BSA. In April, they’ll again represent the BSA at a big event — this time the NRA Annual Meeting in Atlanta. All this in addition to writing articles for the NRA’s blogs, NRA magazine and other shooting sports publications. Jamie, 18, is a freshman at Oklahoma State University studying family and consumer sciences. In high school, she was active in Girl Scouts, Venturing, high school band, church band, softball, Student Council, 4-H and more. Among her many Scouting honors are the Girl Scout Gold Award, God and Life religious award and Venturing Silver Award. She attended the 2013 National Jamboree. Her shooting sports experience spans 10 years, including archery, air rifle, .22 long rifle and shotgun shooting. Jamie says she loves shooting sports (but doesn’t get to participate as much as she’d like) and Scouting. She says she’ll make a good ambassador because she’s an advocate of safe gun handling. Keaton, 18, began his Scouting journey in second grade. In February 2016, he earned the Eagle Scout Award, a feat that didn’t mark the end of his time in Scouting. In addition to Scouting success, Keaton has developed into quite the marksman. He competed in the USA Shooting Olympic Team Trials in May in Arkansas and the USA Shooting National Junior Olympic Championships in June in Colorado. Despite his success with competitive shotgun shooting, Keaton has remained active with Troop 41. He earned Eagle palms and enjoys teaching other Scouts about responsible gun use. Find the application, and lots more info about the BSA’s shooting sports programs, at this link. Your best bet is the comprehensive, well-written Boy Scouts of America National Shooting Sports Manual.